, an author whose fame rests chiefly on his being the editor of Ossian’s poems, was descended from one of the most ancient families in the North of Scotland, being cousin-german to the chief of the clan of the Macphersons, who deduce their origin from the ancient Catti of Germany. His father, however, was a farmer of no great affluence. He was born in the parish of Kingcusie, Inverness-shire, in the latter end of 1738, and | received the first rudiments of his education at one of the parish schools in the district, called Badenoch, from which, in 1752, he entered King’s college, Aberdeen, where he displayed more genius than learning, entertaining the society of which he was a member, and diverting the younger part of it from their studies by his humorous and doggrel rhimes. About two months after his admission into the university, the King’s college added two months to the length of its annual session or term, which induced Macpherson, with many other young men, to remove to Marischal college, where the session continued short: and this circumstance has led the biographer, from whom we borrow it, to suppose that his father was not opulent. Soon after he left college, or perhaps before, he was schoolmaster of Ruthven or Riven, of Badenocb, and afterwards is said to have delighted as little as his antagonist Johnson, in the recollection of that period, when he was compelled, by the narrowness of his fortune, to teach boys in an obscure school. It was here, however, about 1758, that he published the “Highlander,” an heroic poem in six cantos, 12mo. Of this poem, which has not fallen in our way, we have seen two opinions, the one, that it indicated considerable genius in so young an author; the other that it is a tissue of fustian and absurdity, feeble, and in some parts ridiculous, and shews little or no talent in the art of versification. This last we take to be the opinion of the late Isaac Reed, who had a copy of the poem, which was purchased at his sale by George Chalmers, esq. Mr. Reed adds, that in a short time the author became sensible of its faults, and endeavoured to suppress it. 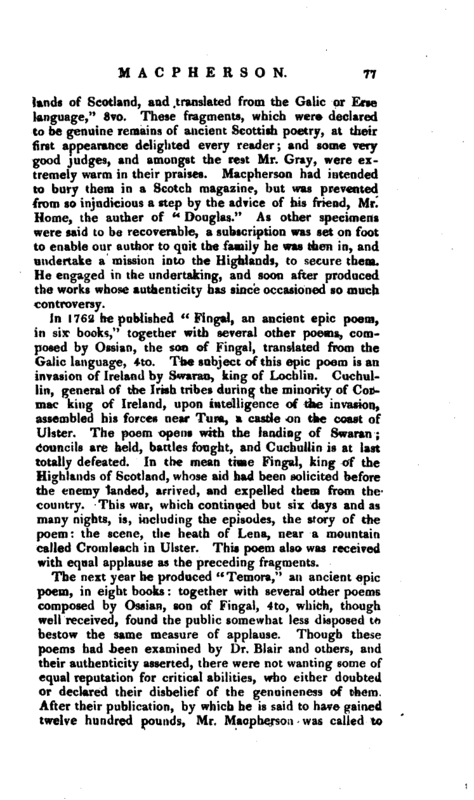 About the same time he wrote an “Ode on the arrival of the Earl Marischal in Scotland,” which he called an attempt in the manner of Pindar, how justly, the reader may determine, as it was published in the European Magazine for 1796. It was intended that he should enter into the service of the church, but whether he ever took orders is uncertain. 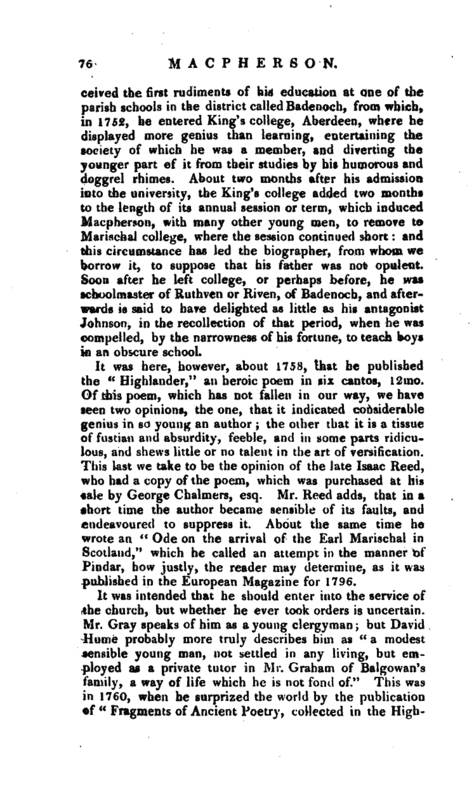 Mr. Gray speaks of him as a young clergyman; but David Hume probably more truly describes him as “a modest sensible young man, not settled in any living, but employed as a private tutor in Mr. Graham of Balgowan’s family, a way of life which he is not fond of.” This was in 1760, when he surprized the world by the publication of “Fragments of Ancient Poetry, collected in the | Highlands of Scotland, and translated from the Galic or Erse language,” 8vo. These fragments, which were declared to be genuine remains of ancient Scottish poetry, at their first appearance delighted every reader; and some very good judges, and amongst the rest Mr. Gray, were extremely warm in their praises. 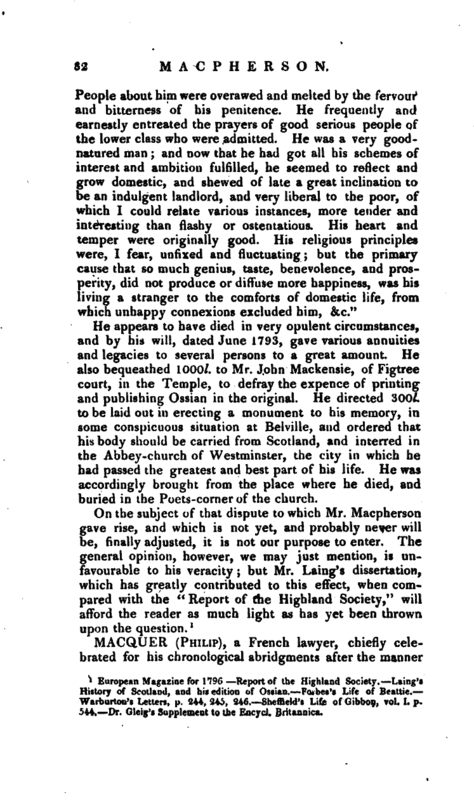 Macpherson had intended to bury them in a Scotch magazine, but was prevented from so injudicious a step by the advice of his friend, Mr. Home, the auther of “Douglas.” As other specimens were said to be recoverable, a subscription was set on foot to enable our author to quit the family he was then in, and undertake a mission into the Highlands, to secure them. He engaged in the undertaking, and soon after produced the works whose authenticity has since occasioned so much controversy. In 1762 he published “Fingal, an ancient epic poem, in six books,” together with several other poems, composed by Ossian, the son of Fingal, translated from the Gaiic language, 4to. The subject of this epic poem is an invasion of Ireland by Swaran, king of Lochliu. Cuchullin, general of the Irish tribes during the minority of Cormac king of Ireland, upon intelligence of the invasion, assembled his forces near Tura, a castle on the coast of Ulster. The poem opens with the landing of Swaran; councils are held, battles fought, and Cuchullin is at last totally defeated. In the mean time Fingal, king of the Highlands of Scotland, whose aid had been solicited before the enemy landed, arrived, and expelled them from the country. This war, which continued but six days and as many nights, is, including the episodes, the story of the poem: the scene, the heath of Lena, near a mountain called Cromleach in Ulster. This poem also was received with equal applause as the preceding fragments. The next year he produced “Temora,” an ancient epic poem, in eight books: together with several other poems composed by Ossian, son. of Fingal, 4to, which, though well received, found the public somewhat less disposed to bestow the same measure of applause. Though these poems had been examined by Dr. Blair and others, and their authenticity asserted, there were not wanting some of equal reputation for critical abilities, who either doubted or declared their disbelief of the genuineness of them. 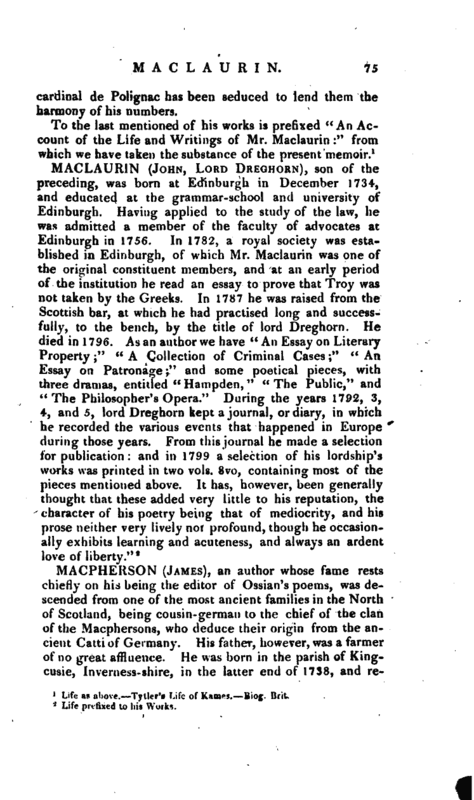 After their publication, by which he is said to have gained twelve hundred pounds, Mr, Macpherson was called to | an employment which withdrew him for some time from the muses and his country. In 1764, governor Johnstone was appointed chief of Pensacola, and Mr. Macpherson accompanied him as his secretary; but some difference having arisen between them, they parted before their return to England. Having contributed his aid to the settlement of the civil government of that colony, he visited several of the West-India islands, and some of the provinces of North America, and returned to England in 1766. 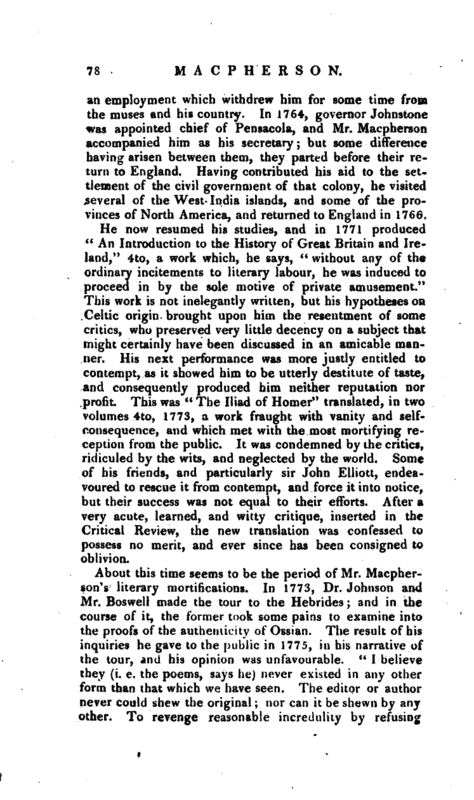 He now resumed his studies, and in 1771 produced “An Introduction to the History of Great Britain and Ireland,” 4to, a work which, he says, “without any of th ordinary incitements to literary labour, he was induced to proceed in by the sole motive of private amusement.” This work is not inelegantly written, but his hypotheses on Celtic origin brought upon him the resentment of some critics, who preserved very little decency on a subject that might certainly have been discussed in an amicable manner. His next performance was more justly entitled to contempt, as it showed him to be utterly destitute of taste, and consequently produced him neither reputation nor profit. This was “The Iliad of Homer” translated, in two volumes 4to, 1773, a work fraught with vanity and selfconsequence, and which met with the most mortifying reception from the public. It was condemned by the critics, ridiculed by the wits, and neglected by the world. Some of his friends, and particularly sir John Elliott, endeavoured to rescue it from contempt, and force it into notice, but their success was not equal to their efforts. After a very acute, learned, and witty critique, inserted in the Critical Review, the new translation was confessed to possess no merit, and ever since has been consigned to oblivion. 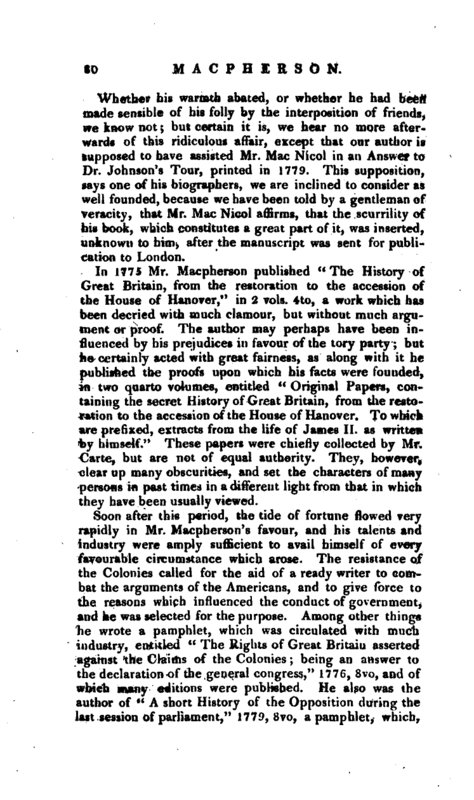 | Whether his warmth abated, or whether he had been made sensible of his folly by the interposition of friends, we know not; but certain it is, we hear no more afterwards of this ridiculous affair, except that our author is supposed to have assisted Mr. Mac Nicol in an Answer to Dr. Johnson’s Tour, printed in 1779. 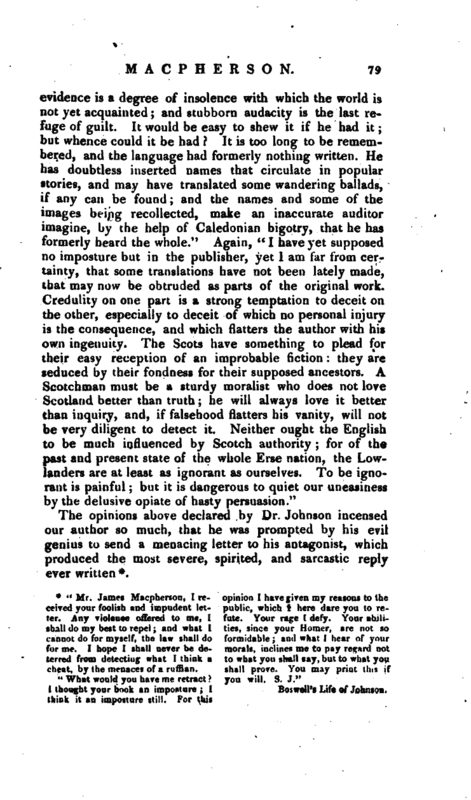 This supposition, says one of his biographers, we are inclined to consider as well founded, because we have been told by a gentleman of veracity, that Mr. Mac Nicol affirms, that the scurrility of his book, which constitutes a great part of it, was inserted, unknown to him, after the manuscript was sent for publication to London. In 1775 Mr. Macpherson published “The History of Great Britain, from the restoration to the accession of the House of Hanover,” in 2 vols. 4to, a work which has been decried with much clamour, but without much argument or proof. The author may perhaps have been influenced by his prejudices in favour of the tory party; but he certainly acted with great fairness, as along with it he published the proofs upon which his facts were founded, in two quarto volumes, entitled “Original Papers, containing the secret History of Great Britain, from the restoration to the accession of the House of Hanover. To which are prefixed, extracts from the life of James II. as written by himself.” These papers were chiefly collected by Mr. Carte, but are not of equal authority. They, however, clear up many obscurities, and set the characters of many persons in past times in a different light from that in which they have been usually viewed. Soon after this period, the tide of fortune flowed very rapidly in Mr. Macpherson’s favour, and his talents and industry were amply sufficient to avail himself of every favourable circumstance whieh arose. The resistance of the Colonies called for the aid of a ready writer to combat the arguments of the Americans, and to give force to the reasons which influenced the conduct of government, and he was selected for the purpose. Among other things he wrote a pamphlet, which was circulated with much industry, entitled “The Rights of Great Britain asserted against the Claims of the Colonies; being an answer to the declaration of the general congress,” 1776, 8vo, and of which many editions were published. He also was the author of “A short History of the Opposition during the last session of parliament,” 1779, 8vo, a pamphlet, which, | on account of its merit, was by many ascribed to Mr. Gibbon. But a more lucrative employment was conferred on him about this time. He was appointed agent to the nabob of Arcot, and in that capacity exerted his talents in several appeals to the public in behalf of his client. Among others he published “Letters from Mahommed Ali Chan, nabob of Arcot, to the Court of Directors. To which is annexed, a state of facts relative to Tanjore, with an appendix of original papers,” 1777, 4to; and he was supposed to be the author of “The History and Management of the East India Company, from its origin in 1600 to the present times, vol. I. containing the affairs of the Carnatic; in which the rights of the nabob are explained, and the injustice of the company proved,” 1779, 4to. In his capacity of agent to the nabob, it was probably thought requisite that he should have a seat in the British parliament. He was accordingly in 1780 chosen member for Camelford, but we do not recollect that he ever attempted to speak in the house. He was also re-chosen in 1784 and 1790. He had purchased, before this last mentioned year, an estate in the parish in which he was born: and changing its name from Retz to Belville, built on it a large and elegant mansion, commanding a very romantic and picturesque view; and thither he retired when his health began to fail, in expectation of receiving benefit from the change of air. He continued, however, to decline; and after lingering some time, died at his seat at Belville, in Inverness, Feb. 17, 1796. In Mrs. Grant’s “Letters from the Mountains” we “have some affecting particulars of his death.” Finding some inward symptoms of his approaching dissolution, he sent for a consultation, the result of which arrived the day after his confinement. He was perfectly sensible and collected, yet refused to take any thing prescribed to him to the last, and that on this principle, that his time was come, and it did not avail. He felt the approaches of death, and hoped no relief from medicine, though his life was not such as one should like to look back on at that awful period. Indeed, whose is? It pleased the Almighty to render his last scene most affecting and exemplary. He died last Tuesday evening; and from the minute he was confined till, a very little before he expired, never ceased imploring the divine mercy in the most earnest and pathetic manner. | People about him were overawed and melted by the fervour* and bitterness of his penitence. He frequently and earnestly entreated the prayers of good serious people of the lower class who were admitted. He was a very goodnatured mart; and now that he had got all his schemes of interest and ambition fulfilled, he seemed to reflect and grow domestic, and shewed of late a great inclination to be an indulgent landlord, and very liberal to the poor, of which I could relate various instances, more tender and interesting than flashy or ostentatious. His heart and temper were originally good. His religious principles were, I fear, unfixed and fluctuating; but the primary cause that so much genius, taste, benevolence, and prosperity, did not produce or diffuse more happiness, was his living a stranger to the comforts of domestic life, from which unhappy connexions excluded him, &c."
He appears to have died in very opulent circumstances, and by his will, dated June 1193, gave various annuities and legacies to several persons to a great amount. He also bequeathed lOOOl. to Mr. John Mackensie, of Figtree court, in the Temple, to defray the expence of printing and publishing Ossian in the original. -He directed 300l. to be laid out in erecting a monument to his memory, in some conspicuous situation at Belville, and ordered that his body should be carried from Scotland, and interred in the Abbey-church of Westminster, the city in which he had passed the greatest and best part of his life. He was accordingly brought from the place where he died, and buried in the Poets-corner of the church. 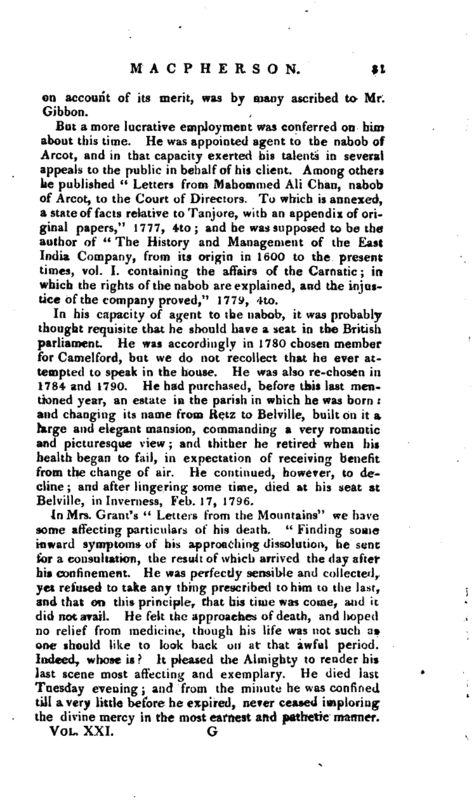 European Magazine for 1796 Report of the Highland Society. Laing’s History of Scotland, and his edition of Ossian. Forbes’s Life of Seattle. Warburton’s Letters, p. 244, 243, 246. Sheffield’s Life of Gibbon, vol. I. p. 544. Dr. Gleig’s Supplement to the Encycl. Britannica.